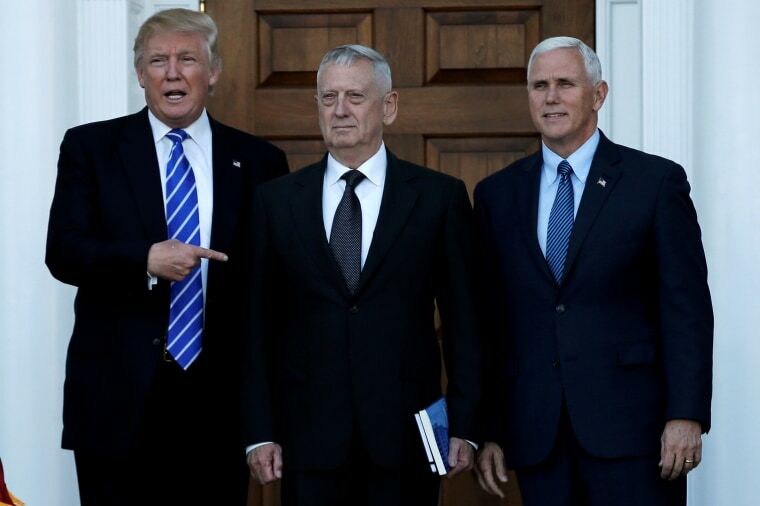 Donald Trump announced via social media Sunday that Marine Gen. James Mattis is a contender to serve as secretary of defense in his administration. “General James ‘Mad Dog’ Mattis, who is being considered for Secretary of Defense, was very impressive yesterday. A true General’s General!” Trump tweeted. General James "Mad Dog" Mattis, who is being considered for Secretary of Defense, was very impressive yesterday. A true General's General! Trump met with Gen. Mattis for about an hour Saturday afternoon at the Trump National Golf Club in Bedminster, New Jersey. After the meeting, Trump told reporters the general was "a great man, the real deal." Mattis who boasts 44 years of service in the Marines, is a retired four-star general who earned accolades for his leadership during the Iraq War, particularly 2004’s Battle of Fallujah — largely considered one of the bloodiest clashes of the war. "Mad Dog" also led a task force in southern Afghanistan in 2001 and a Marine division during the Iraq invasion. He served as commander of NATO’s Allied Command Transformation in Norfolk, Virginia before earning a 2010 promotion to run U.S. Central Command — a position that placed him in charge of all American forces stationed in the Middle East. Since leaving the military, Mattis has been a loud critic of Obama’s Iran nuclear deal and has derided the current administration’s lack of desire to pursue military confrontations. Mattis retired from the military in 2013. If nominated by Trump, however, Congress could provide Mattis a waiver, allowing him to pursue the position. Congress has only used a waiver once in the history of the country: in 1950. This allowed President Truman to appoint Gen. George Marshall to the position, who served as secretary of defense for a single year. Mattis would not be the first former member of the military appointed by Trump, nor does he come without controversy — specifically the way he has spoken about Muslims and promoted violence in the past. "It's fun to shoot some people. I'll be right up there with you. I like brawling,” Mattis said in 2005 at a panel discussion in San Diego, California. The potential secretary of defense pick was a lieutenant general at the time and was referring to men in Afghanistan "who slap women around for five years because they didn't wear a veil." And, referring to the rules to live by in Iraq, he told a group of soldiers a 2003 speech, "Be polite, be professional, but have a plan to kill everybody you meet." Trump reportedly first offered Gen. Jack Keane, a retired four-star Army general, the opportunity to lead the Pentagon. In an interview with NPR Sunday, Keane explained that he declined the offer. "I was asked to serve, but I'm not able to," Keane told NPR's Rachel Martin. "I have some personal issues surrounding the death of my wife recently, and I explained all of that to Mr. Trump, and he was very gracious and understanding, and quite supportive." Keane was married to his wife Theresa for 51 years. She died in June after a battle with Parkinson's Disease. Keane said he provided Trump two recommendations, telling the president-elect to consider Gen. Mattis and Gen. David Petraeus, the former CIA director. Meanwhile, the president-elect continues to have meetings through the weekend, as he promised on Twitter. On Sunday he was scheduled to meet with conservative writer John Gray; Kansas Secretary of State Kris Kobach; Wilbur Ross, founder of the private equity firm WL Ross and Company; New Jersey Gov. and former chair of Trump’s transition team Chris Christie; Former New York City Mayor Rudy Giuliani; Black Entertainment Television Founder Robert Johnson; and David McCormick, a former official in the George W. Bush administration and president of Bridgewater Associates — a global macro investment firm. The president-elect also used the social media platform on Sunday morning to criticize the cast and producers of Hamilton, Saturday Night Live and Sen. Harry Reid, while providing bipartisan praise for future Senate Minority Leader Chuck Schumer.